The highest peaks of the Pyrenees are on the Spanish side in Aragon. This holiday takes you off the beaten tourist track into these magnificent mountains, with a host of things to see along the way! You will see a bodega on the Barbastro wine road, medieval stone villages, Canfranc’s huge ‘ghost’ train station, Hemingway’s Pamplona, and an imposing 11th-century Romanesque castle. You spend four nights in Jaca, ‘Pearl of the Pyrenees’, and three nights on the coast, including one in historic Tarragona. Day One: Flight to Reus or Barcelona. Transfer to your hotel on the Costa Dorada, under an hour away, for two nights’ half-board accommodation. Day Two: Free day in resort. There will be a resort orientation walk this morning. Day Three: Today you leave the coast and head north through the hilly wine country of Catalonia and then into the Aragonese Pyrenees. You make a short stop at a Somontano winery for a tasting in one of Spain’s oldest wine regions, magnificently set against a spectacular Pyrenean backdrop. From here you climb into the Pyrenees proper towards the unspoiled and historic walled town of Ainsa. At the confluence of two rivers, and at an altitude of nearly 2000ft, Ainsa nestles between three different protected natural park areas. From the 11th-century castle, you can stroll the short distance to the arcaded medieval town square, lined with old stone houses, the church of Santa Maria – and welcoming bars and restaurants! There are impressive views down to the two rivers and up to the (often) snow-streaked 7500ft. crag of Peña Montañesa. 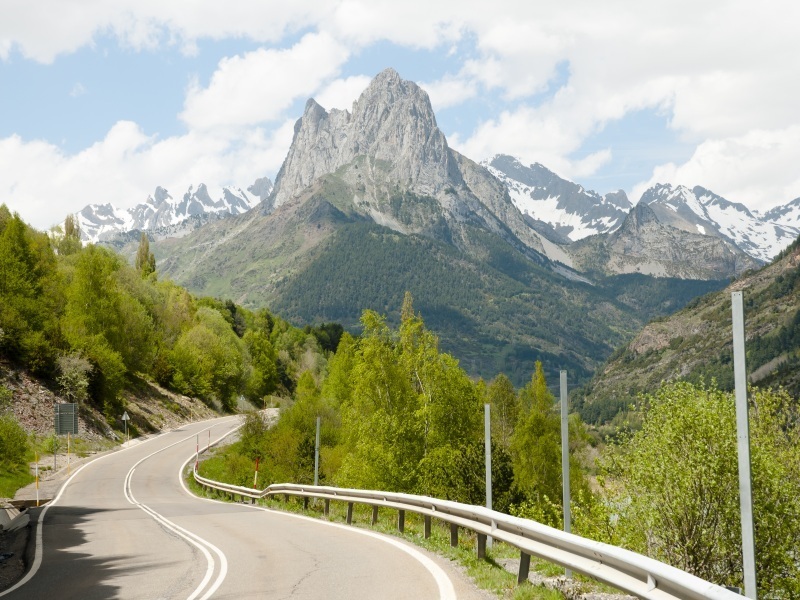 You continue on your dramatic route to Jaca, where you spend 4 nights on a half-board basis. 200 miles today, mainly on excellent new highways, and always through wonderful scenery: towering mountains, rocky outcrops and sparkling waters are all in evidence. Jaca is an interesting town with a pleasant pedestrianised main street, medieval town wall, Romanesque 11th-century cathedral and 16th-century citadel, as well as other notable historic buildings. Jaca has bid three times to host the winter Olympics, and is on the Aragonese Way of St James – pilgrims on their way to Santiago de Compostela are regular visitors in the historic town centre. Day Four: In the morning, you have a brief orientation walk in the old centre of Jaca. In the afternoon, there is a short, but fascinating included excursion to Canfranc-Estacion. Following the River Aragon up the mountain valley, you arrive at the enormous, mainly disused, former international railway station at the exit of the Somport Tunnel on the Spanish side. Its size (more than twice the width of Buckingham Palace and with no less than 156 doors!) is explained by the necessity to handle the transit of passengers, luggage and freight switching to and from the different gauges of French and Spanish tracks: though national pride must have had something to do with it as well! On a short tour of the station you will hear about its construction, stories of Nazi gold passing through, of the exodus during the Spanish Civil War, and about its final closure in 1970. Afterwards, you take the short scenic drive up to the nearby French border and through the ski resort of Candanchu. 18 miles each way. Days Five and Six: In Jaca with one included and one optional excursion. The included excursion is to Pamplona, the capital of Navarre, famed worldwide for the ‘Running of the Bulls’, featured by Hemingway in ‘The Sun Also Rises.’ Your local guide will walk you along the bulls’ route to the bullring and show you the town’s focal point, the Plaza del Castillo, near to which lies the former Jewish Quarter and the Gothic Cathedral of Santa Maria. Part of the old city wall is still intact. The city centre is pleasantly compact and there are myriad places for tapas, lunch, strolling or hunting for souvenirs. 70 miles each way. The optional excursion is to the French side of the mighty Pyrenees. The first stop is in the pretty village of Biescas. From there you drive – as ever – through impressive mountain scenery, skirting two reservoirs and reaching the French border at Portelet and on to Artouste, on Fabreges Lake. A cable car takes you up to the ‘Petit Train’- a 55-minute narrow-gauge run of spectacular views at an altitude of over 6000ft. The line was built to aid the construction of another dam and reservoir, and opened to tourism in the 1930s. The road journey, again on good roads through impressive mountains, is 43 miles each way. Day Seven: Today you bid farewell to the mountains, passing the impressive 1000ft high rock formations of Los Mallos de Riglos, and stopping at the equally impressive castle of Loarre – the best preserved Romanesque castle in Europe, and set on a rocky outcrop offering great views. You continue on to Tarragona, where your last night is on a bed and breakfast basis. Tarragona’s walled town centre is a UNESCO world heritage site. It boasts a fine medieval cathedral as well as Roman remains: these include a stunning 2nd-century amphitheatre, Circus Maximus, and two forums. 190 miles today. Day Eight: Free time until your departure transfer to the airport for your flight home. Transfer time: 15 minutes to Reus, just over one hour to Barcelona.